This ensemble drama details the lives of married couple Michael Steadman (Ken Olin) and Hope Murdoch Steadman (Mel Harris), and their group of friends in their 30’s. Michael, an advertising copywriter, and Hope, a part-time social worker and part-time stay-at-home mom, are adjusting to becoming new parents. Real-life issues plaguing the interfaith couple is deciding which religion their child should have. Gary Shepherd (Peter Horton) was Michael’s college roommate and is now a free-spirited professor of English literature. When he is denied tenure at the University of Pennsylvania, he considers becoming a social worker and meets Susannah Hart (Patricia Kalember). They eventually marry and have a daughter named Emma. 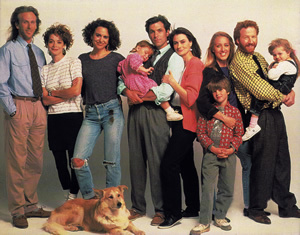 Michael’s cousin and Gary’s former girlfriend is Melissa Steadman (Melanie Mayron), a sometime-Vanity Fair photographer. Melissa becomes involved with a younger man, Lee Owens (Corey Parker), a house painter, but the relationship is fraught with problems. Hope’s childhood friend, Ellyn Warren (Polly Draper), works for City Hall and has relationship trials of her own. She is initially involved with co-worker Steve Woodman (Terry Kinney); later has an affair with a married man, Jeffrey Milgrom (Richard Gilliland), and finally becomes involved with graphic designer Billy Sidel (Erich Anderson). Creators Ed Zwick and Marshall Herskovitz (My-So Called Life, Once and Again) use personal experiences as part of the storylines which make for emotional hours of television. The show was heralded for its honesty in portraying introspective young professionals in their quest for happiness both at work and at home.